Photography and cinema have been partners in recording memories, art and history of a generation and nation. I marvel the efforts of photographers of preserving the images shot during the shoot of a movie. Photographer's role is significant in the process of recording the story behind the scenes and during the takes. Now, witness Cesar Hernando's works that span 3 decades in cinema in an exhibit. Cesar Hernando’s Mula Sa Mga Aninong Gumagalaw: Behind The Scenes 1971-2001 collects snapshots taken by the artist over the course of three decades working in Philippine cinema. 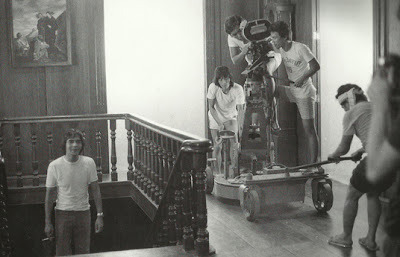 A Fine Arts graduate from the University of Santo Tomas, he began as assistant director to National Artist Ishmael Bernal for his debut feature, Pagdating sa Dulo (1971). Later on, he would garner accolades and awards for his meticulously researched and imaginative designs for Mike de Leon’s Kisapmata (1981) and AKO Batch ’81 (1982) as well as for Maryo J. de los Reyes Tagos ng Dugo (1987) starring Vilma Santos. But aside from the mainstream, he was also a key figure in the underground cinema of the 1980’s—a precursor to the “indie” scene in the 2000’s—by collaborating with a new generation of filmmakers including Palm D’ Or recipient, Raymond Red. 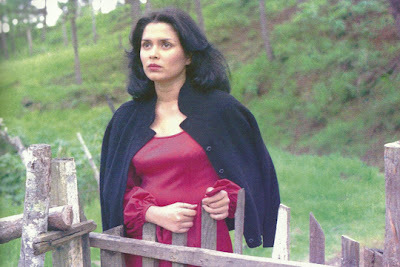 He would do production design on the latter’s first full length feature, Bayani (1993). Hernando would also design Lav Diaz’s five-hour film, Batang West Side (2001). The term “aninong gumagalaw” is a literal translation in Filipino of “moving shadows” and was commonly used to refer to motion pictures in the ‘30s and ‘40s. Hernando has done some short feature films in 35mm like Maalinsangan ang Gabi (1993), Motorsiklo (2001), and Kagat ng Dilim (2006) starring Piolo Pascual. He is also a graphic designer and a professor at the University of the Philippines’ College of Fine Arts. The exhibit opens on Friday, July 15, 2011 at 4:00pm, prior to the 6:00pm Opening Event of the Cinemalaya 7 Independent Film Festival at the CCP. Exhibit runs until August 28, 2011. Admission is free. Museum hours are from 10:00am to 6:00pm, daily except Mondays and holidays. For particulars, call CCP Visual Arts and Museo at (632) 8323702.